I should be able to set my display name for each channel specifically. Not all channels are going to be places I will want to use the exact same display name. Further, one of my channels is not related to my real life identity at all, but instead to my Stack Exchange identity, so I want to use my Stack Exchange pseudonym and not my real life name there. Plus, on principle, the section fully titled “Private information (not shown publicly)” should not be used to set information that is, you know, shown publicly in a channel. Previously the information in this field was strictly between Stack Exchange and myself. It wasn't supposed to be a public display name feature, and shouldn't be adapted for that purpose. Accordingly for the time being I've set my private information's full name to just “doppelgreener” so that this is the only name that shows up in channels I'm in, where I don't want my full name displayed. Yes please. I had to drop my surname from my Full Name field (and thus my CV) because I was invited to the "Stack Exchange Moderators" team. I would have done the same had I been invited to some FOSS group. Not the answer you're looking for? Browse other questions tagged feature-request display-names privacy stack-overflow-for-teams . Private information (not shown publicly) -> they are… aren't they? 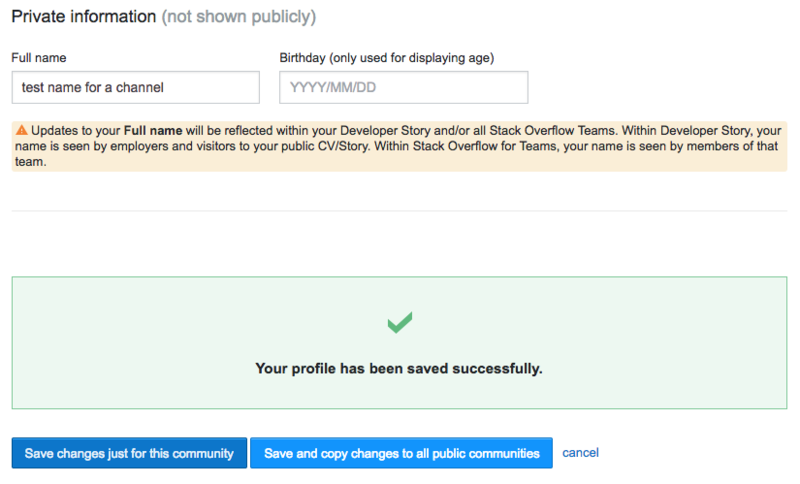 How and why was my Stack Exchange profile changed without my knowledge or permission?